Luxury holiday gifts from France. Baccarat crystal and gift baskets. Handcrafted figurines. 18-kt. gold-plated and silver-plated pewter. Hand enameled and hand set with Swarovski® crystals. This Nativity Scene has been created by artist Michael Aram, who was inspired by his childhood memory of his own family's nativity set and the joy surrounding its installation each Christmas. The beauty of the piece is expressed through its sculptural quality, intricate metalworking techniques, and through the use of mixed metals. Handcrafted 14-karat gold plated pewter cross. Hand-enameled and embellished with Swarovski® crystals. Handcrafted figurine. 18-kt. gold-plated and silver-plated pewter. Hand enameled and hand set with Swarovski® crystals. Christmas ornament made of resin and nickel-plated and gold-tone metal. Ornament stand made of iron. Antiqued-bronze finish. 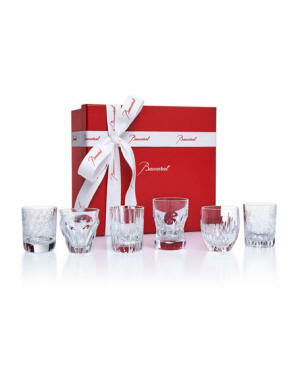 Six-piece set of assorted tumblers in a beribboned gift box. Lead crystal. Six-piece set includes one of each design shown. France From the Mille Nuits Collection by Mathias. Handcrafted flute. Full-lead crystal. Venetian-style, beveled cut. 11.25"T; holds 5.875 ounces. Hand wash. Made in France. Everyday crystal shot glasses by Baccarat. Set of six. Bring a twinkling touch of style to your decor with this crystal accent from Baccarat, showcasing beautifully beveled edges and rich hue. Handcrafted frame. Lead crystal. Made in France. Horizontal bevel cuts on the outside and vertical bevel cuts on the inside for a brilliant optical effect. Maximizes the unpredictability of perception. Made of lead crystal. Made in France Crystal frame. Horizontal cuts on one side and vertical cuts on the other for an extraordinary visual effect. Distinctive votive holder offers a stunning interplay of light: horizontal cuts on the outside and vertical cuts on the inside paired with vibrant color to sublimate the light. Handcrafted of crystal. Handcrafted vase. Art Deco-inspired design. Lead crystal. Cut-crystal surface scatters the crystal reflections. 7.875"T. Hand wash. Made in France. White porcelain. Stylized Christmas trees and stalwart nutcrackers; holly garland and dainty gold and green accents. Mug, 4"H. Made in France. Each glass precision etched with a different design. Lead-free glass. Set includes one of each design shown. White porcelain. Border, stylized Christmas trees and stalwart nutcrackers; holly garland and dainty gold and green accents. 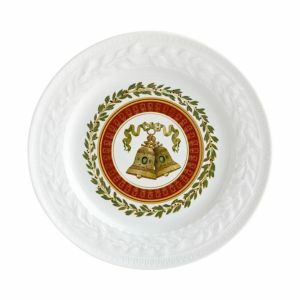 Bread and butter plate, 6 1/2" diameter. Made in France. We’ve updated our favorite table trough to hold a trio of tapers surrounded by plants, adding candlelight to your events and centerpieces. Hand-crafted from solid brass, a water-tight design welcomes 4” drop-in plants. 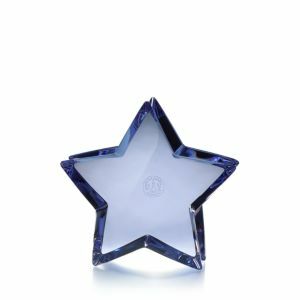 Crystal star décor designed by Daniel Libeskind. We’ve updated our favorite table trough to hold a trio of tapers surrounded by plants, adding candlelight to your events and centerpieces. Hand-crafted from durable iron, a water-tight design welcomes 4” drop-in plants. The toile print in the Noelle collection calls back to the nostalgic, warm energy of the holidays and is the perfect accent for your Christmas decor! The festive woodland theme of the Winterland collection makes this traditionally inspired watercolor design pop in any holiday decor and is sure to give it an impressive touch. Dress your bedroom with the quilted diamond and sophisticated style of the Red Velvet collection. Bands Pillar Candle, 6" Jaipur Living Florenza Red Solid Down Throw Pillow 20"
Our 6" Red & Green Bands Pillar Candle stands elegantly on its own or create a dramatic centerpiece by grouping it with pillars and tapers of varying heights. 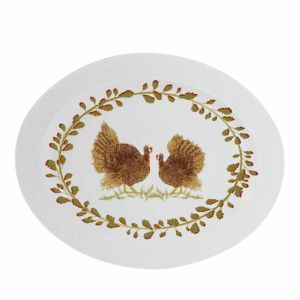 This lovely light makes a thoughtful hostess gift, too. This texture-rich throw pillow lends a soft contemporary look to sofas and beds. A wave ruched design creates a dimensional feel on this bold red cushion.